The Class 3A state champions will play nationally ranked Centennial, which won Arizona's Class 5A state title last week. The matchup will air on ESPNU. Eastside Catholic is back on the practice field. The newly crowned Class 3A state champs accepted an invitation to play in the GEICO State Champions Bowl Series. The Crusaders (12-1) will travel to play Centennial (14-0) in Peoria, Ariz., on Dec. 22 at 7:30 p.m. on ESPNU. Centennial won Arizona’s Class 5A state title and is ranked 25th in the nation by USA Today. “(It’s) a great honor,” Eastside coach Jeremy Thielbahr said Saturday. This is the second time this season Thielbahr will coach his star-studded team against a national power. Eastside opened the season with a 35-12 loss to then-ranked Oaks Christian of California in September. 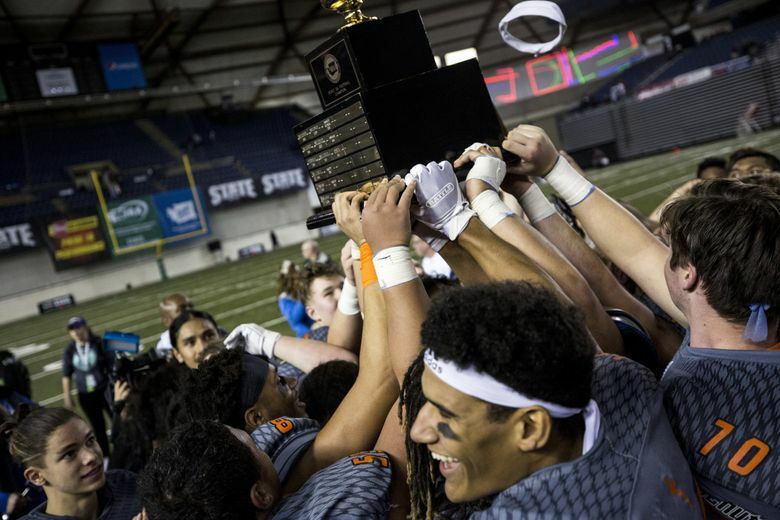 The Crusaders went on to win the Metro League championship and the program’s first state title since 2015. Four high-school teams are invited to participate in the GEICO Bowl Series. The second matchup and location is expected to be announced within the week.